New Delhi: Shares erased early gains to fall to their lowest close in three weeks, dropping for three straight sessions, dragged down by the country’s largest utility vehicles maker Mahindra & Mahindra after it reported a drop in quarterly profit. “Market is dancing to the tunes of various events happening around us," said Gajendra Nagpal, chief executive at Unicon Financial Intermediaries. “The very fact that market opened so strong was because global markets went up over the weekend. Then the market came down, shed all the gains, so they covered the gap, and the market is trying to look up once again," he said. Asian stocks rose on hopes that new technocratic leaders in Italy and Greece will take decisive action to save their indebted nations from bankruptcy and fend off a wider financial meltdown in the euro zone. Export-driven outsourcers rose as optimism over Europe, their second-biggest market, boosted the sector’s outlook. The euro zone debt crisis is a worry for the sector that has been looking to increase its sales to the region to hedge against its excessive exposure to the United States. Infosys, which has the second biggest weightage on the benchmark index after Reliance Industries, rose 1.2% to Rs2,808.80. Smaller rival Wipro rose 1.4%. 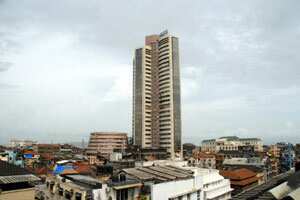 The main 30-share BSE index closed down 0.43%, or 74.08 points, at 17,118.74 -- its lowest closing level since 24 October. More than two-thirds of its components closed in the red. The index, which rose as much as 1.16% earlier, is still down 16.5% this year. “The market is not going to see significant low from current levels in a hurry. There is no news as such from the domestic front," Unicon’s Nagpal. Automakers dragged on the benchmark index the most, with Mahindra and Mahindra falling as much as 7%. It closed down about 6% at Rs791.05. A series of interest rate hikes have hurt automakers this year, as India’s middle-class, the primary target segment for most carmakers, shied away from new purchases due to costlier loans and rising prices. Top carmaker Maruti Suzuki dropped 3%. Tata Motors fell 2% ahead of its results for the second quarter. It is expected to report net profit fell 7%. The broader 50-share NSE index closed 0.4% down at 5,148.35 points. There were more than three losers for every gainer in the broader market, underlining negative sentiments for small- and mid-cap firms. About 609.6 million shares changed hands. “For now, the continued buoyancy in inflation remains the key concern for the domestic-economy watchers," Sandesh Kirkire, CEO of Kotak Mutual Fund, wrote in a note. European shares turned negative on Monday before an auction of up to €3 billion of five-year Italian bonds that will test investors’ appetite for the country’s debt and could set the equity market’s near-term direction. At 03:45 pm, the FTSEurofirst 300 index of top European shares was down 0.26%. World stocks, as measured by the MSCI world equity index, rose 0.1%. • Balrampur Chini Mills fell 10.5% after it posted a wider-than-expected loss for July-September. • Shree Renuka Sugars fell 25.6% after Bank of America downgraded the stock to “underperform" from “buy" and lowered its target price, citing lower-than expected September-quarter profit due to the delayed turnaround of its Brazilian operations. • Kingfisher Airlines rose 8.9% ahead of its quarterly results. The cash-strapped carrier is considering a proposal to sell property to help pave the way for debt restructuring, a senior banker said on Monday.